Find a frame that you like. 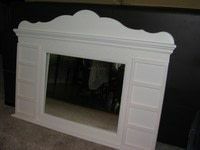 Mine was actually a mirror from Habitat for Humanity Restore for $25. I took the mirror out a reused it in another project. I replaced the mirror with glass. 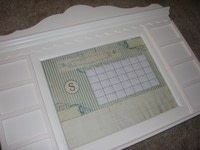 The frame MUST have glass, or it won't be dry erasable. 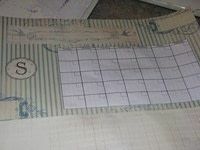 Use scrapbook paper, wrapping paper, photos, whatever background you want for your calendar. 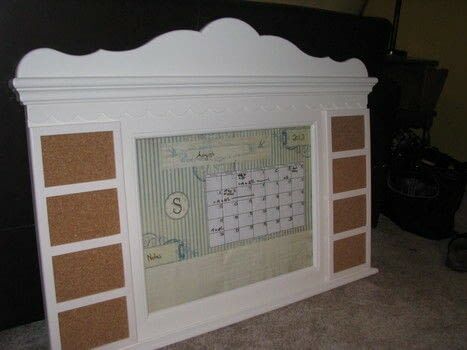 Print out a blank calendar (legal size works nicely). I used Excel to make mine, but Google search can also find one for printing. 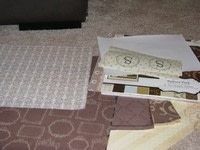 Layout your design and glue the pieces into one piece. 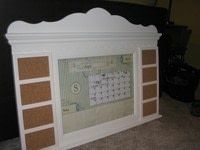 Put your calendar back in the frame and you're ready to go! I added some cork for pinning stuff. Because of the glass, you can use dry erase markers just like you would on a whiteboard. They come off just as easy as you are use to.